I woke with a start, not entirely sure what had jolted me into consciousness in the middle of the night. Was it a muffled footstep in the deserted hallway? A disembodied whisper next to my ear? A slight movement in the shadows in the corner of my cell? I shuddered and huddled deeper under the covers, not really wanting to take a closer look. I had fallen asleep reading in my bunk bed, the light on the wall still burning bright. I switched it off, plunging the cell into darkness. I swear it wasn't this dark last night. Everything was eerily quiet on the fourth floor, and the only source of illumination at that time of night was in the form of the weak winter moonbeams that filtered through the barred windows in the hallway. It seemed the perfect atmosphere in which to spot a spectral figure gliding down the hall, and I did my best not to think of any of the creepy ghost stories I'd heard about the building earlier in the evening. Just as I was teetering on the edge of sleep, a metallic drip-dripping noise began in the hallway, seemingly right outside my cell. It's just the heating, I told myself. This building is 150 years old; old buildings make creepy noises at night. But when the noise didn't stop and I couldn't stop thinking about a ghostly figure sitting at the bottom of my bed, I gave in and turned the light back on. I would spend my night in prison not unlike many before me — scared out of my mind. For the record, I wasn't really in prison. And, for the record, I was not visited by any ghosts or goblins during my stay (at least, I don't think so!). I was in an old jail, though — the Carleton County Gaol in Ottawa, Ontario, which is now the HI Ottawa Jail Hostel. 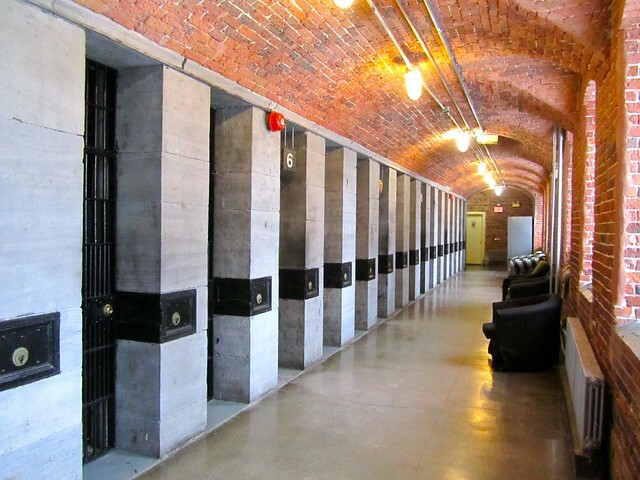 The prison first opened in 1862 as Ottawa's main detention center for everyone from drunkards to murderers. When it opened, it was a model prison; the prison many other prisons would be built to emulate. It went on to serve as the area's main jail for more than 100 years. But when it was finally shut down in 1972, it was because of the jail's inhumane conditions. 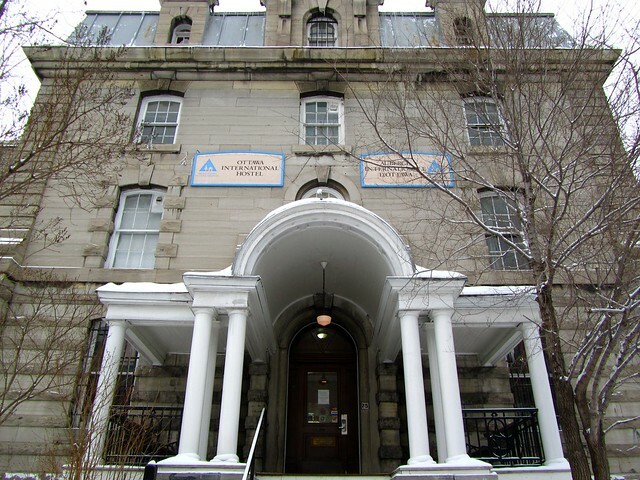 After the prison was shuttered, it briefly faced an uncertain future, until Hosteling International purchased the building and converted it into the Ottawa Jail Hostel. For the first few years the hostel was in operation, guests paid to sleep in actual, unaltered jail cells — cells that were roughly 9×3-feet; just big enough to fit a narrow bed behind a barred door. Eventually, though, the first 7 floors of the jail were renovated into more hospitable hostel conditions. Today, guests can choose from a variety of shared and private jail cells, as well as more traditional hostel dorm rooms — all of which come complete with free wi-fi and a free continental breakfast in the morning. But, despite the renovations, the Ottawa Jail Hostel is still far from your average backpacker's hostel. I can't say I've ever experienced a hostel quite like this before. 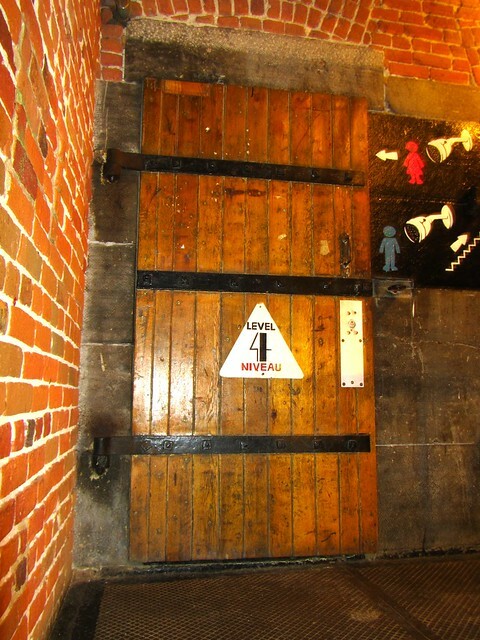 The first thing I noticed upon entering the Ottawa Jail Hostel were the heavy, wooden doors. These are the real deal, left from when the building was an operating prison. Yes, the hostel has been brought into the 21st century with free wifi, keypad entry for security, and a bar in the basement, but much of its past remains front and center. 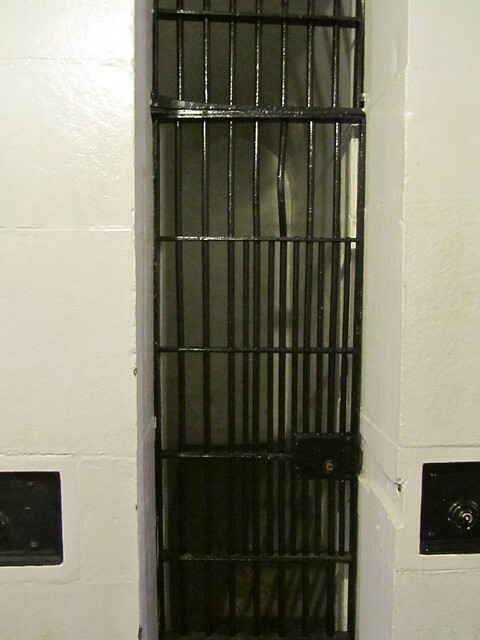 The “rooms,” while clearly larger than the original jail cells, are still contained behind iron-barred doors. The stairs still have “suicide bars” on them, which would have prevented prisoners from jumping to their deaths (or pushing guards to their deaths) in the stairwells. And there are still bars on all the windows. When you sleep here, you really do feel like you're in prison. 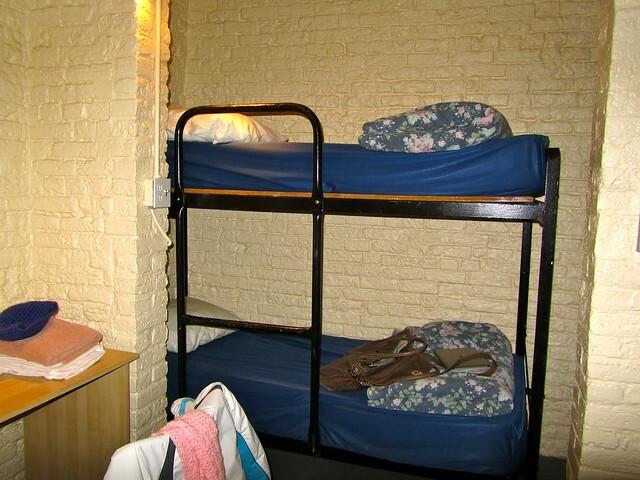 This is not a hostel you stay in because you want a comfortable, cozy place to rest your head at the end of the day. Yes, the showers are clean, the blankets are warm, and the mattresses are thicker than some I've slept on. But you don't stay here for all that. You stay here for the experience. And believe me, staying at the Ottawa Jail Hostel certainly is an experience. I'm not a huge fan of ghost stories. Whether I believe in ghosts or not, the stories tend to freak me out. But I knew I could not stay in a place that has made it onto various “most haunted buildings” lists (including Lonely Planet's “Top 10 spookiest buildings around the world“) and not get to know it's past — no matter how ghastly. So on my first night at the Jail Hostel, I signed up for the nightly “Crime and Punishment” tour. Run in conjunction with The Haunted Walk, this tour takes you to some of the un-renovated parts of the former prison and gives you an idea of what it was like to be a prisoner here 100 years ago. 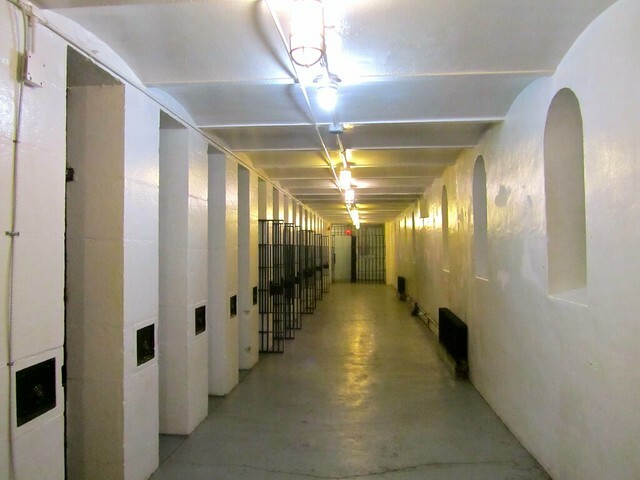 The tour takes you first to solitary confinement in the basement (where prisoners were often chained down naked, belly-first) and then heads up to the 8th floor — the floor with the most dark history in the building. 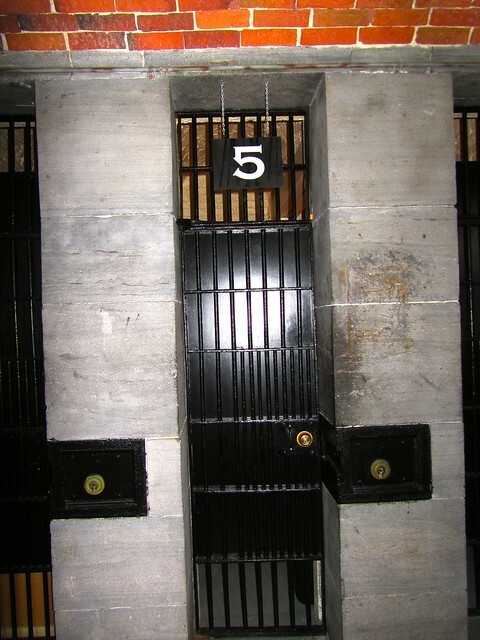 The 8th floor, largely un-renovated and left to look as it did when the prison closed in 1972, is home to dark cells and a few prison relics, as well as Death Row and the gallows, which are still fully operational. The 8th floor tour began in just a regular jail hallway, where our guide Fraser explained what jail life would have been like in the early years at the Carleton County Gaol. 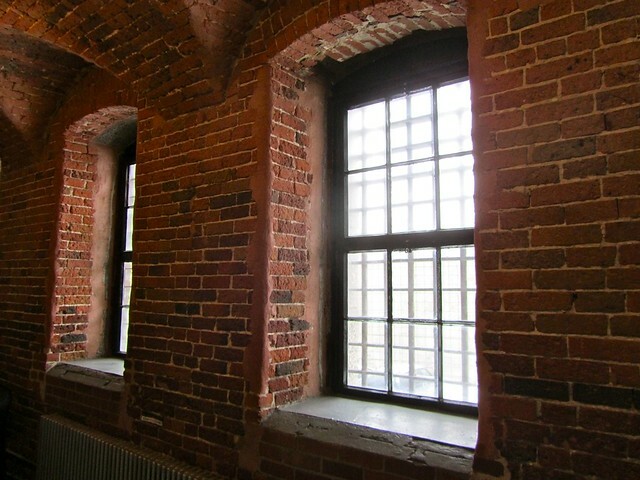 For the first few years the prison was in operation, there was no glass on the barred windows, and the prisoners slept without beds. I shivered as I imagined facing an Ottawa winter in a narrow stone cell with nothing between me and the elements but a thin wool blanket. It's no wonder an undocumented number of prisoners died here. Fraser also explained why the Carleton County Gaol was such a model prison when it opened. Part of the reason was because of the design of the cells — they have what are called drum ceilings, or arched ceilings that give the halls fantastic acoustics. As a guard, you could sit at the end of the hall, and hear even the softest whisper from the cell furthest away from you. An Austrian guy named Michael and I tried this out, with him going in an old cell and whispering something as I stood at the other end of the hall. I could hear him as clearly as if he were standing next to me. See how far away he is? After heading to the other side of the 8th floor and getting a glimpse into the cells that would have been shared by 3 or more people, we headed to the most sinister part of the building: Death Row. Canada no longer observes the death penalty, but it did up until 1976. Three men were put to death at the Carleton County Gaol — two of whom may have actually been innocent. The most famous prisoner to die at the Ottawa gallows was a man by the name of Patrick Whelan. Whelan was accused of assassinating Thomas D'Arcy McGee in the 1860s, and it was public opinion more than anything that convicted him. The evidence against Whelan was weak, but because McGee was considered one of the fathers of Confederation in Canada and was a friend of the prime minister at the time, weak evidence was enough for a conviction. Whelan maintained his innocence until he was hung in 1869 in what would be Canada's last public execution. More than 5,000 people came in the middle of a snowstorm to watch Whelan die, and a miscalculation on the part of the hangman meant that, instead of a quick death, Whelan took up to 7 minutes to expire at the end of his rope. He was then denied his last wishes of having his body buried in his family grave in Montreal, and instead was buried in an unmarked grave in the prison's courtyard. No Catholic priest would come to conduct a funeral for him at the prison, and it is said that Whelan's restless soul still haunts the jail. I learned more about Whelan and the other spirits who are said to haunt the Ottawa Jail Hostel the next evening, when I took Haunted Walks' “Ghost and Gallows” tour of the building. I always maintain that any guided tour either succeeds or fails depending on the guide, and this was a perfect example of that. While the ghost stories shared on the tour were indeed spooky (plenty of people, for example, have claimed to have seen Whelan's ghost perched at the ends of their beds in the middle of the night), the script for the tour was clearly rehearsed and memorized, and fell a bit flat. I found the guide on the “Crime and Punishment” tour the night before to be much more engaging, and the facts shared on that tour to be much more interesting. Are any of these surprising to you? While other versions of the ghost tour might be great, my experience wasn't. It didn't help that the guides for these tours wear cloaks and carry around lanterns… I think it would be hard to take some of their stories seriously to begin with. 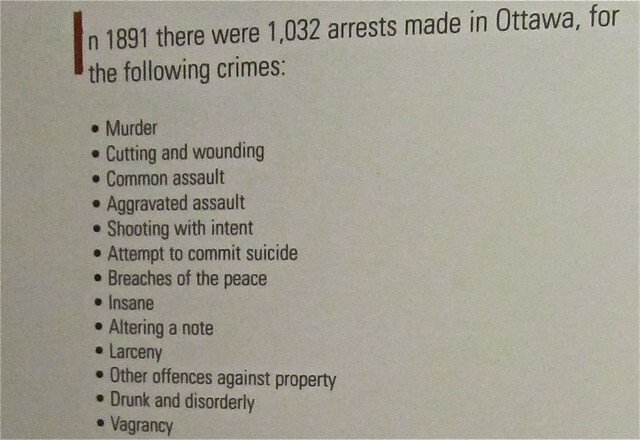 If you're going to take any of the tours at the Ottawa Jail Hostel, I would recommend the “Crime and Punishment” tour over the “Ghost and Gallows” tour. If you want to brave a night or two with the spirits at the Ottawa Jail Hostel, I highly recommend it. It's affordable, and within walking distance to all the major spots in downtown Ottawa, including the Byward Market area and Parliament Hill. And, if nothing else, it'll certainly be a great story to tell later. Click here to book at the HI Ottawa Jail Hostel. Would you dare to stay at the Ottawa Jail Hostel? *Note: My stay at the Ottawa Jail Hostel was complimentary, as were my Haunted Walks tours. As always, however, all opinions are my own. Love the research and details you’ve included on this…always wanted to check this place out! Did you experience any ghostly presences?! The building has so much history, I didn’t think it would be fair to write this post and not include all those details! Hey Amanda, I simply loved your write up about your stay here. You certainly paint a great picture about your experiences and what you’ve learned. Well done! Thanks so much Veronica! Glad you liked it, even though it’s a bit long! I’m a big baby when it comes to scary/creepy things, but I knew I couldn’t go to Ottawa and not spend a night or two here! The things I do for this blog…. 😉 Haha. I don’t regret it though! It definitely makes for a good story. It wouldn’t have been nearly as creepy if I’d been with someone else. I don’t know that I’d go back my myself! Great post. I’d heard about this hostel, but I’ve never stayed there. In theory I think I could do it, but I might be screaming if I heard/saw something strange. People were asking me if I hoped I would see/hear/feel anything. And I was a bit torn. I mean, having some sort of paranormal experience sure would have made a great blog post! But I would have been so terrified, I probably would have had to leave. Lol. And no way would he ever stay in a cell, he lived in the wardens old apartment. One night he and his wife heard the clunk clang of what may have been the gallows and a mans voice cried out “he is gone, he is gone” they did not leave the apartment to check it out. Wow, this definitely could have been an episode of Ghost Adventures! It’s definitely a one-of-a-kind experience. I always enjoy reading all of your blog posts! I wonder if the Ghost Adventures guys know about this spot? I could totally picture them doing an episode there! Thanks, Laurence! I wanted to do something a bit different with this post. 🙂 As far as me becoming a horror novelist… I think I’m far too much of a scaredy cat for that! I’d wind up giving myself nightmares. It certainly is a hostel I will never forget staying in! Did you have any creepy experiences there? I dont know why i have the feeling that some of those sounds that you heard on the second night might have been the ghosts….Otherwise, you should have heard them on the first nights since the building was still the same.. something just didnt appear on the first night but on the second when there was no light….spoooky!!! An experience indeed! If you’re even in Ottawa, definitely spend a night or two here! Great find! Love places like this. Thanks, Stephanie! It sure beat staying in your average hotel or hostel dorm room! What a creepy but unique experience! I love all the facts and history included, and I think the weirdest thing on that imprisonment list was ‘altering a note.’ Huh?! I doubt I would have been able to sleep well either. I’ll definitely have to give it a try sometime. Definitely creepy, and definitely unique! If you ever get the chance to check it out, I’d highly recommend it. I agree that the “altering a note” item was confusing. We couldn’t figure out if it meant altering a bank note (like, money), or altering some sort of letter. Imagine getting throw in prison for forging mom’s signature! Lol. OMG! I love this! My husband and I are definitely going. We’ve spent the night actually ghost-hunting at other places, and always wish we could stay in old jails and other places like this. So, you’ve clinched it: we’re going to Canada this year. Awesome! If you’re into ghosts and ghost hunting, I feel like this would be the perfect place for you guys to visit!! And Ottawa is a very cool city, to boot. If you do go, you’ll have to be sure to report back on what you find/experience! I would not have slept one minute! There are a lot of things I would do, but mess with my insomnia on purpose is not one of them! Thanks! I hadn’t even heard of this place until a few weeks before I went to Ottawa. I’m really glad I checked it out, though! I can’t believe those 9×3 cells, and that people were actually stuck in them! And solitary confinement consisted of being chained facedown on the floor! Sheesh, no wonder this place was shut down. Fascinating post, Amanda – I would never stay here myself, but I really enjoyed reading about it. Thanks, Christy! Taking the tour(s) here was probably one of my favorite things I did in Ottawa. It was all quite fascinating for someone like me who really likes history. But yeah… I certainly wouldn’t have wanted to be a prisoner there! This is so interesting. I have always wanted to do a tour at Alcatraz. I can’t imagine if I actually had to sleep there though. Too creepy! I can totally understand where you’re coming from — sleeping in a place like this certainly isn’t for everyone! Yikes! That place looks creepy! It takes some courage to stay such a haunting place. It made for an interesting read! Glad you enjoyed the story! If not for this blog, I probably wouldn’t have stayed there… haha. I dont normally read hostel reviews, but the Ottawa jail hostel is just so unique! I havn’t stayed there myself but I know people who have. Such an interesting place! It’s definitely, hands-down, the most unique hostel I’ve ever stayed in! Awesome, I think you’re the first one who’s been there as well! Glad to hear you enjoyed it. What a fun review! I’d absolutely give this hostel a try. Well if you ever find yourself in Ottawa, definitely do it! Now that’s a place with some character! Yup, this hostel is certainly not lacking character! But that’s what makes it awesome. One of the best reads I have had this week thanks for sharing. Slightly creeped out though haha. Aw thanks, Cole! I had a lot of fun writing this one, so it’s great to see that so many others are enjoying it, too! Single or double cell? Oh boy… Seriously, I don’t think I could stay there. I REALLY don’t like ghost stories or creepy places (I blame it on a tramautic childhood experience seeing a play, which oddly enough led me to a career in the theatre…). Sounds fascinating though! What I do love about hostels is the colorful pasts they’ve had. Have you seen the Suk 11 Hostel in Bangkok? It’s a bunch of buildings put together and they just banged through the walls to create hallways. Really cool place! Yeah, this place may not be for you, Aaron! Lol, it was definitely creepy. But I agree that one of my favorite things about staying in hostels is learning about their pasts — some of them are so interesting! Thanks, Cheryl! 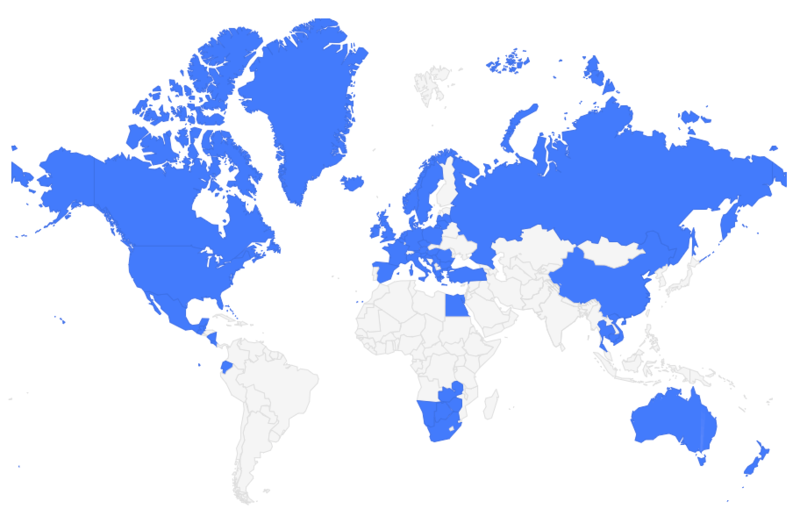 Maybe it’s just me, but I feel like Canada is often grossly overlooked in travel blogs. So I’m happy to be able to add something! And if you like weird places, then you certainly would love this hostel! Very cool experience Amanda! I would totally check this out because I have a thing about touring old jails. Definitely going to mark this one down. Yes, make note for sure! Even if you don’t stay there, going on the tour would be worth it. Awesome! When you guys do make it there, you’ll have to be sure to let me know what you think! There is no way I would be able to sleep there, but I guess that’s the point ha! Haha, yes, that’s definitely part of the allure of this place, I think! The experience is definitely worth it, though, if only for the story you’ll get to tell afterwards! While I was reading this I was reminded of the old jail from the early 1900s in Dublin. That place made my skin crawl and I wasn’t sleeping there. This sounds like an amazing adventure. Very cool hostel idea! Ah, yes, Kilmainham Gaol? I visited there when I was in Dublin a few years ago. Definitely creepy!! That one is much bigger than the Ottawa jail. But I’d wager the one in Ottawa may be just as eerie at night! I, too, have a slight aversion to hostels. But I made an exception for this one, and am glad I did! I would love to stay there. I can imagine it is easy to let your mind wander when things go bump in the night though! SO easy to let your mind wonder to creepy things! But still worth it, I think, even though I was scared half the time. Lol. Loved reading this post…your stay there certainly sounds interesting! I think I would be too much a wimp to stay there… generally I don’t get very scared but there’s just something about old jails… good for you though, great story and experience! Glad you enjoyed this, Kerri! It wasn’t exactly what I’d call “enjoyable” to stay there, but I’m glad I did it. It sure makes a great story to tell now! I’ve always wanted to spend the night in a (supposedly) haunted locale. I did a ghost tour in The Rocks, but it’s so well lit and crowded (as a popular tourist spot here in Sydney) that you couldn’t really get a feel for anything remotely spooky. Haha, it’s not an easy decision, is it? Honestly, if it weren’t for this blog and the ability to tell this creepy story here, I’m not sure I would have voluntarily stayed in this place!! Haha, almost too creepy for me, but definitely makes for a good story now! It was certainly an experience! It’s nice to go this kind of experience! Next summer, i will be staying in a box hostel for a night, it will be interesting experience like this one! A box hostel? Sounds interesting! First, I am a steadfast skeptic of the supernatural. Went on the Ghosts and Gallows tour last week. While on the death row level, the tour guide was down by cell 1 spinning his yarns. It was pitched black by the way, lit only enough to make out each other’s figures and barely faces from close proximity. A friend and I wandered away from the group to peer into cell 4, which is the cell closest to the gallows, and the cell you would be put in as your execution date approached. 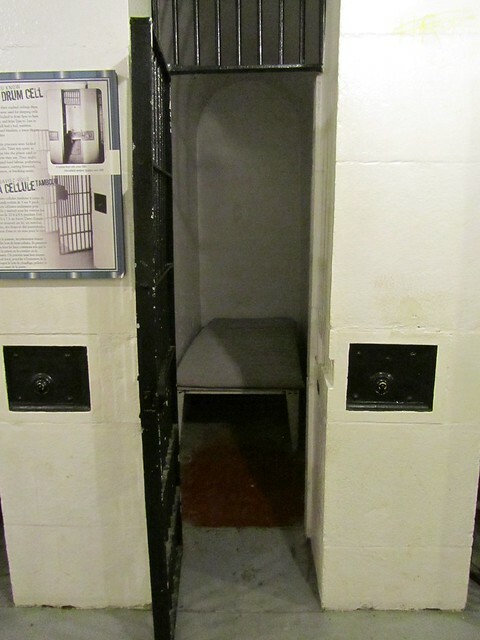 Whelan was put in this cell. I held my iPhone up to the bars to illuminate the cell so we could see in. There were two cots and a folded metal chair against the back wall between the cots. I moved my phone closer to the bars to illuminate the cell more clearly, and damned if the chair didn’t tip over and come crashing to the ground. There was nobody in the cell that we could see. I’m sure it was a setup but it was pretty creepy. Not sure if I could ever fall asleep there! Interesting place though. Haha, yeah, I definitely had trouble sleeping because I was so creeped out! OMG, I gotta do this when I visit Ottawa next month! what an experience to write about! Yes, you absolutely should!! Definitely makes for a great story. I learned about this place on an episode of “my ghost story” on the biography channel. They said you can explore the 8th floor at your own risk and they cannot garentee your safety. Some people have lost fingers and injured themselfs pretty badly up there. Then they mention that the reception clerks usually just turn off the 8th floor camera because they see so much creepy activety and that most people quit the job after a few weeks cuz most get too creeped out. Well the episode caught my interest so i looked it up and found your blog on it! I will definetly be checking this place out on my own and want to explore the 8th floor at night by myself with just a flashlight! Thats how to do it! I’ve stayed here twice now and I love this place! The first time I stayed there was on a school trip, we stayed for a week touring Parliament and museums and whatnot. I was 16 at the time and the first night there me and my friends couldn’t sleep so we went down into the lobby/sitting room to talk so we wouldn’t wake other people sleeping. There was a ouija board there so we started fooling around with it and saying how “this is stupid, its not haunted”, the door to the mens bathroom literally slammed shut. Nobody was down there, we all flipped out and ran towards the stairs and when we all looked back we seen this black blur moving towards us then got a light headed feeling. Ended up not sleeping that night. If you know of any haunted places to stay at in Canada that’s worth the trip please let me know. I’m in Alberta, Canada if that helps. Thanks for the read! Spooky story for sure, Ben! It definitely is a neat place to stay though; not many hostels like it in the world! I actually have heard about that one! Next time, for sure. I stayed there in 2005 and have a photo with a ghost face in it! Still creeps me out looking at it still to this day!! I really should of sent it to the jail. Was arrested and put behind bars at the jail. So the prison gard wanted to know how strong he was, well I guess the bars bent like that speaks for itself. I completely fell for the title – thought you had been up to no good! By spring of 2002 I had that experience , I had shuch a couriosity , I was traveling from Honduras throught east Canada, Thay time I arived from Toronto to Ottawa by bus at 6:00 o’ clock un the morning, (I was the first guess) by the whole day I Was walking throught the city included the parliament building and a tour by the whole prisson (Hostel) At night I was so tired , I went to sleep about 10;00 pm, honestly I didnt have any scary experience. I enjoyed my stay in that Nice city. 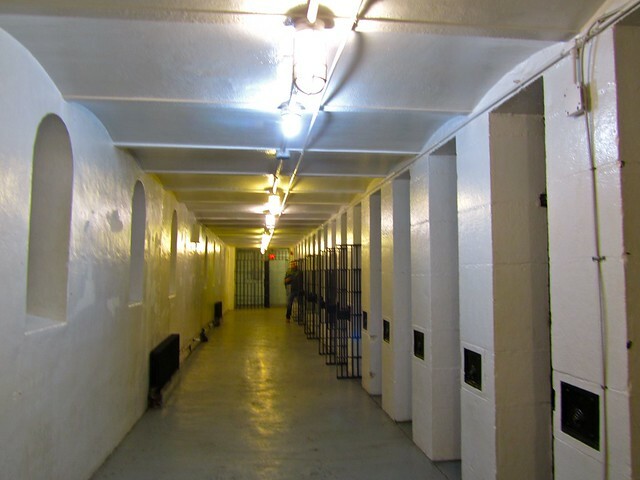 I stayed there last night & by the solitary confinement area & a dryer had turned on after saying “this place has some bad energy”.. Couldn’t sleep but well worth the see!